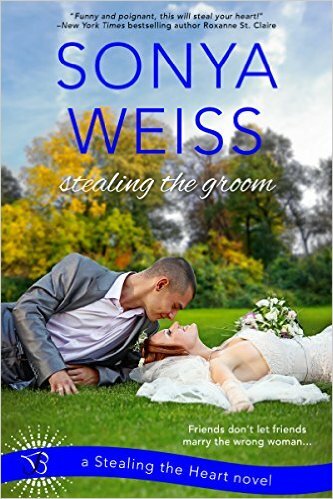 My debut novel released in March and I’m joining a group of talented writers in the “Meet My Character Blog Tour” where you’ll get to meet Chad Walker the hero in STEALING THE GROOM. Thanks to Stacy Finz for letting me join the tour. Stacy Finz is the author of GOING HOME, a book about the very hot Rhys Shepard and heroine Maddy Breyer. Rhys Shepard has agreed to come back to rebuild Nugget’s crumbling police department and to take care of his estranged father, who’s in the mid stages of Alzheimer’s disease. But he’s not willing to stay more than six months in the town where he never felt accepted. Maddy Breyer has fled to Nugget to escape her own domestic drama and plans to convert a ramshackle Victorian into a five-diamond inn, even if it means capitalizing on California’s most shocking tragedy. Stacy is an award-winning journalist and winner of the Daphne du Maurier Award. She once lived in Quentin Tarantino’s former apartment. She has a great sense of humor and an affinity for cowboy boots. The hero, Chad Walker, is loosely based on a very swoon-worthy guy with a wonderful heart. He’s a by-the-book kind of hero who can’t stand to deviate from his well-thought out life plan. The story takes place in Sweet Creek, South Carolina, a small town where Chad has lived all his life. What drives Chad to avoid love? After seeing love destroy his father, Chad is determined to avoid that messy emotion whatever the cost. His avoiding love is exactly why he plans a business-only marriage to a gold digger type woman he doesn’t care about in order to get the shares he needs from the family business. When his best friend from childhood, Amelia Snyder, finds out he’s about to marry the Queen of Mean, she groom-naps him the day of his wedding and ruins his plan. Since Chad still needs a wife, he ends up marrying Amelia and his life is thrown into utter chaos as a lifetime of friendship heads toward love. Shannon Lee Alexander‘s debut YA book, LOVE AND OTHER UNKNOWN VARIABLES is due to release with Entangled Publishing in the fall of 2014. You can find out more about Shannon at her website http://www.shannonleealexander.com/ or on Twitter. She’s also on Facebook. Stacy Reid is the author of historical romances including the top-selling THE DUKE’S SHOTGUN WEDDING released with Entangled Publishing’s Scandalous line. Stacy has her own fabulous love story you can read about on her website http://www.stacyreid.com/. You can follow her on Twitter and check out her Facebook page. Love Chad and loved STEALING THE GROOM! Thanks for not breaking the chain (you overachiever, you). You are so darned funny! Loved the quitting story. As for George Clooney, I think I would have disabled that vehicle and offered help LOL. Yeah Sonya, would have been tempting! Stacy, your book sounds like a fun read! I know, Lynn…very tempting. I had the chance to read portions of Stacy’s book while it was in the creation stage and it was fantastic. Loved that hero. Enjoyed meeting Chad, and your story sounds great! I have yours marked on my calendar because I don’t want to miss it!